Subaru has a camera-based, driver-assist system that they call EyeSight. The Subaru EyeSight system uses a camera that has color recognition so it can see the red brake lights on the vehicle ahead or an upcoming red traffic light. "EyeSight® Driver Assist Technology is the culmination of everything Subaru engineers know about safety, and Subaru has sold over 1 million EyeSight-equipped vehicles. Adding confidence to every trip, EyeSight monitors traffic movement, optimizes cruise control, and warns you if you sway outside your lane. EyeSight has been found to reduce rear-end crashes with injuries by up to 85%. When equipped with EyeSight, all tested 2019 Subaru models receive the highest possible rating for front crash prevention by IIHS. The Pre-Collision Braking feature can even apply full braking force in emergency situations, helping you avoid or reduce frontal impacts." 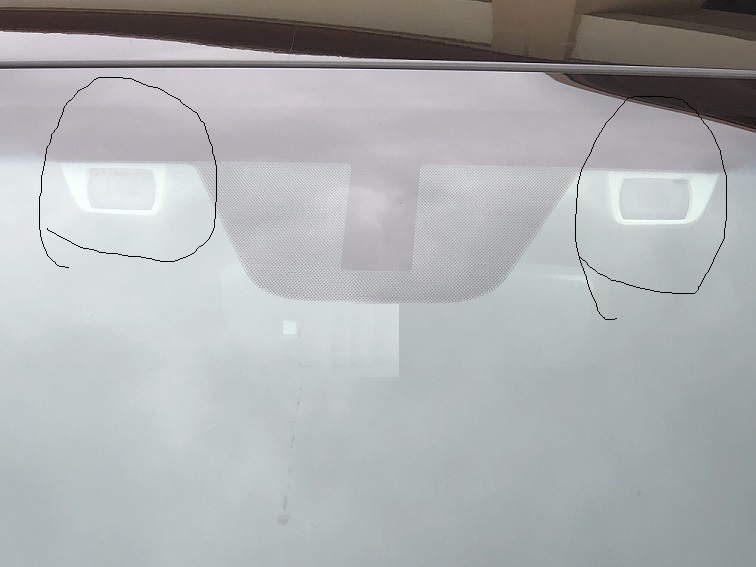 Many clients with Subaru vehicles come into our shop and want us to install a dark strip of tint - what we call a "visor strip" and others refer to it as an "eyebrow strip" - to the top of the windshield to reduce the glare they are faced with when traveling towards the sun. The problem for us is when these vehicles are equipped with Subaru's Eyesight system. We have thoroughly investigated the wisdom of placing a window film over the cameras and believe it is a huge mistake to do so. Anything placed in front of the cameras of this safety feature will reduce its ability to function properly and effectively render them useless in a collision situation. Anyone who places window tinting in this area of the windshield on a vehicle with this system can be held liable should the vehicle be involved in an accident where it was determined the Eyesight system was not working properly as a result. Since we care about the safety of our clients, we will refuse to tint the windshield in the area of the Eyesight cameras so as not to obstruct the clear view of these sensitive cameras and to insure their proper operation. This means we will NOT place a visor strip at the top of the windshield. It also means that if you have the windshield tinted in a very light ceramic film to reduce the heat, we will see to it the film does not obstruct the cameras. We will remove the windshield film around the cameras thereby leaving a void of clear glass. Our position on this issue is NOT negotiable.